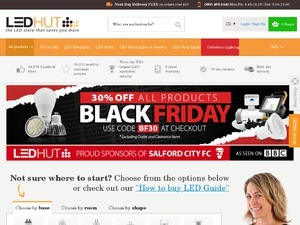 Do not miss another Led Hut Ltd voucher! Simply leave your e-mail address and we'll always keep you informed of new vouchers for Led Hut Ltd.
Offer condition: Hive Products Only. Offer condition: Exclusions apply. See site for details. Offer condition: Selected products only, exclusions apply. Offer condition: Selected items only. Offer condition: Selected Zinc products. Offer condition: Selected Nordlux products. Offer condition: Filament bulbs only. Offer condition: Apply Code at Check Out. See website for more details. Offer condition: Outdoor lighting only. Cannot be used in conjunction with any other offers. Offer condition: Apply code at check out. Limited time - Halloween day only. See more details on site. Offer condition: Excludes Smart Home and Clearance products.